After a wait of four years, James Bond is back for the 50th anniversary. Skyfall is the 23rd film in the official series (24 if you count Never Say Never Again) and it truly is a great 007 flick. Three films in, you’ve either accepted Daniel Craig as James Bond or you haven’t. The series has changed a little. It had to change to remain successful and profitable. However, it’s never forgotten its roots and that is very evident with Skyfall. As it’s possible some may still not have seen Skyfall yet, I will avoid the spoilers. The basic plot revolves around a stolen hard drive with agent’s names and locations on it. It’s up to Bond to recover it before more damage is done. Daniel Craig is in excellent form, still playing Bond with a harder edge yet more than capable of doing the classic lines (Bond… James Bond), drinking his drink (still shaken not stirred) and still getting the girl (the exotic Berenice Lim Marlohe as Severine). Judi Dench is back for her seventh appearance as M and puts in her best performance to date. After all, when was the last time you got to see M in action? Our Bond villain is Raoul Silva, played marvelously by Javier Bardem (No Country for Old Men). He is the most unique villain we’ve had for quite a while and will surely stand his ground alongside legends like Blofeld and Goldfinger. Ralph Fiennes (Lord Voldemort from the Harry Potter series) is Gareth Mallory, chairman of the Intelligence and Security Committee, who is ordered to regulate the changing of the guard at MI6. Naomie Harris plays Eve, the agent who is forced to shoot Bond in the opening sequence. Ben Whishaw plays the new Q, adding a new take to a very familiar role. Finally, our Bond girl for this film is Severine, as played by Berenice Marlohe. Amongst the chase scenes, mind games and sexual tension we’ve come to expect in a Bond film, there are some moments that leave a Bond fan very satisfied. Seeing Bond drive a certain car with a very familiar theme playing made me feel 10 years old again watching the ABC Sunday Night Movie and whatever Bond film they were showing that week. We also get to discover more about Bond’s past, something never really touched on in previous films. With that, there are some genuine moments of tenderness and mutual respect between M and Bond that we’ve never seen before and I doubt we will again, at least in the same way Dench and Craig pull it off here. The intense action sequence involving Bond’s past is full of classic explosions and over-the-top fight sequences. The movie is filmed in a less frenetic style than Quantum of Solace, which is sure to make longtime fans happy. And, of course, we get a tremendous opening credit sequence with the theme performed by Adele. It is classic Bond and one of the best theme songs we’ve had in quite a while. And the final minutes of the movie clearly pay homage to the past, right up to the now very familiar words “James Bond Will Return”. If you’re a Bond fan, you will not be disappointed. If you’ve never seen a 007 adventure, this is a great place to start. It is the highest grossing James Bond film to date and sure to please just about everyone. I personally really like Daniel Craig’s performance. It’s not overly suave, like Brosnan could be at times, and cheesy, like Roger Moore eventually turned into. Daniel Craig has signed on for two more films. Count me in! 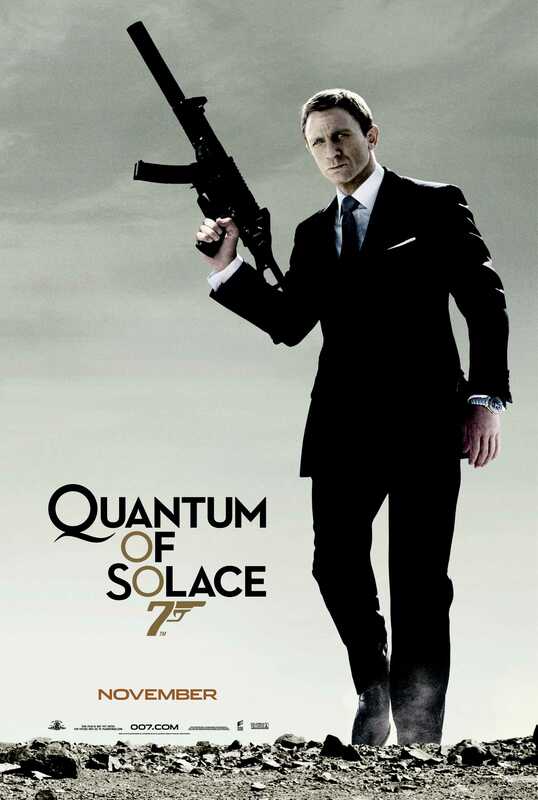 Two years after Daniel Craig assumed the role of James Bond in Casino Royale, we were given Quantum of Solace. Other than the death of Tracy Bond back in Our Her Majesty’s Secret Service, we’ve never had two Bond films that essentially tell one story. It was a bold move that worked in some aspects, yet failed in others. As a standalone movie, Quantum of Solace suffers from a plot that picks up the threads left at the end of Casino Royale, which ultimately make it hard to enjoy on its own merits. It opens with a typical Bond car chase…well, not typical as the action is very frenetic. From those opening minutes, you know this isn’t the Bond we’ve grown up with. At least he was driving an Aston Martin. And right out of the gate, one of the film’s inherit problems becomes evident. It looks and feels like too much of Jason Bourne film. The crazy action works in that franchise but has no place in the world of 007. Bond has captured Mr. White, picking right up from the final frame of Casino Royale. Upon being interrogated, he reveals a hidden organization called Quantum, the rebooted version of the old SPECTRE. Unfortunately, Quantum seems less deadly and more convoluted. Our main villain is Dominic Greene (Mathieu Amalric), who is one of the tamer adversaries Bond has faced over the years. The plot is somewhat confusing but centers around Greene’s plan to steal the water in Bolivia and then to charge a high price to sell it back to the very country he stole it from. Along the way, Bond is killing everyone left and right. A bit offsetting but somewhat acceptable considering he has been betrayed and surely is in mourning over the death of Vesper. M, one again played by Judi Dench, trusts Bond despite his penchant for killing everyone. The chemistry between Dench and Craig is solidified here and shows a partnership between the two characters that we’ve never seen before. It would continue to grow in the next adventure, Skyfall. In the end, Greene is defeated and his plot thwarted. Bond also gets the answers he needs regarding Vesper and whether or not she really loved him. As M tells Bond she needs him, he responds by telling her he never left. Then, the iconic gun barrel opening wraps up the film, symbolic that Bond is now the Bond we’ve come to know. He’s dealt with tragedy and ready to move on. Our supporting cast includes Olga Kurylenko as Camille Montes, who has her own mission of revenge on General Medrano. Not the typical Bond girl, which clearly makes sense considering where Bond is at emotionally at this point. The lovely Gemma Arterton (Clash of the Titans) plays MI6 agent Strawberry Fields, Bond’s only conquest in the movie. Her first name is never mentioned on-screen but is clearly a throwback to the classic Bond girls. Sadly, her character disappears and doesn’t return until the end of the movie, but her return clearly has an impact on Bond. Giancarlo Giannini is back as Rene Mathis, whom Bond mistakenly thought was a traitor in Casino Royale. Jeffrey Wright also appears as Felix Leiter again. Reviews for the movie have been mixed. Personally, while I enjoy it, it is not my favorite Bond movie. I dislike the frenetic action sequences as they just seem out of place. Bond dismissal of Mathis’ body also bothers me for some reason. The plot doesn’t seem epic enough despite the underlying story of revenge. And our main villain, Dominic Greene, gets in a good fight sequence towards the end but just falls a little flat for me in the menacing department. Even Roger Moore disliked the movie, wondering what was going on half the time. I was also greatly disappointed by the opening sequence and theme song, performed by Jack White and Alicia Keys (the first time the theme song was sung by two artists as a duet). The sequence looks cheap somehow and the song really doesn’t feel like Bond. That said, Daniel Craig puts in another amazing performance and cemented his position as one of my favorite two Bonds. He’s in good company with Sean Connery. And as the final seconds of the movie indicate, James Bond will return. Unfortunately, none of us knew we’d have to wait 4 long years for Craig’s third adventure. Hollywood has been making remakes as long as they’ve been making movies. It’s nothing new. Sometimes the remake surpasses the original but most of the time it always has a little less than what the first movie had. In 1924, author Richard Connell published his short story, “The Most Dangerous Game” in Collier’s Weekly. It featured Sanger Rainsford, a big-game hunter who falls off a boat only to wash ashore an island inhabited by a mad Cossack named General Zaroff who has grown tired of hunting animals and moved on to shipwrecked sailors. The overall premise of big-game hunting was very popular in the 1920s, so the story was topical and very successful. In 1932, RKO Pictures filmed the first adaptation entitled The Most Dangerous Game. It’s considered a classic, due in large part to the cast that includes Joel McCrea, Fay Wray and Robert Armstrong. Why RKO would decide to do a remake just 13 years later remains an odd decision. 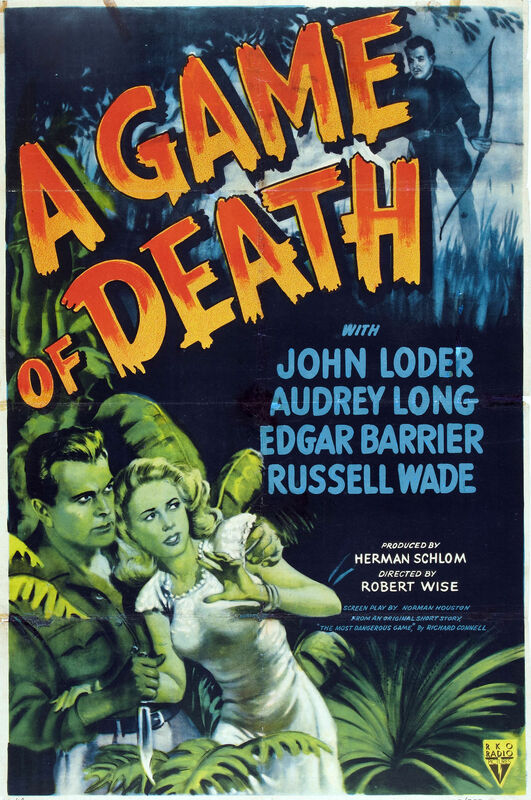 Nevertheless, A Game of Death was released in 1945. At first glance, the movie has a now very recognizable director in Robert Wise. It was only his fifth film, following other horror classics The Body Snatcher and The Curse of the Cat People. However, much bigger and better things were in his future, including The Day The Earth Stood Still in 1951 and big-time musicals like West Side Story and The Sound of Music. The movie has atmosphere and moves along at a nice pace for its 72 minute run time. However, the cast just can’t live up to the original. John Loder (How Green Was My Valley) stars as Don Rainsford, who is the sole survivor of a shipwreck. With all crew lost, it becomes immediately apparent that the buoys were moved to lure the ship too close to the shore. He survives only to find a castle on the nearby island inhabited by Erich Krieger, played by Edgar Barrier (1943’s Phantom of the Opera). Audrey Long stars as Ellen Trowbridge and Russell Wade is her brother Robert. As it becomes apparent Krieger is mad, the hunt is on. A good story well handled by Wise but the cast just can’t pull off performances to even match the original cast. Other than Loder, most of the cast didn’t have careers worth mentioning. The plot remains true to the original story, as Erich Krieger is hunting man to fill his lust for the perfect kill. We do get some stock footage from the original, which just adds the question of why do the remake in the first place. We must remember that this was before the days of television. If you wanted to see a movie, you had to go to the movie theater. So even though it was only 13 years since the original had been made, moviegoers didn’t have the resources to watch their favorites at any hour of the day. It was a good story and a new audience was still hungry for the adventure it had to offer. So, the bottom line is that there was money to be made. In that context, it makes sense to do the remake. Unfortunately, when you’re dealing with a less than adequate cast, the movie is going to suffer and immediately be compared to the original. You have to offer something the first film didn’t. Despite the direction of Robert Wise, it offers nothing new and doesn’t come close to surpassing the original. Therefore, it’s no surprise this movie is another “lost” horror classic. Having never been released to home video and getting virtually no television play, it has found a new audience through Netflix streaming. If you’ve never seen the original, skip this version and seek out the 1932 classic. However, if you’re looking for something new, take the 75 minutes to sit back and watch a decent movie. It’s fun to compare the two different versions. It’s hard to believe that I’ve been listening to Vince Rotolo and the B-Movie Cast for 224 episodes now. There are a handful of podcasts that I listen to, most of which I contribute voicemail to periodically. However, the B-Movie Cast is the only one in which I’ve been lucky enough to guest co-host. Vince just posted episode 225 and it marks my fourth appearance on the show. 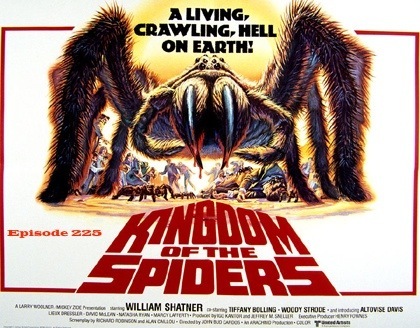 We go over the 1977 cult classic Kingdom of the Spiders starring William Shatner. If you’ve never listened to the show before, get out from under your rock and give it a try at http://bmoviecast.com/. Regular episodes feature Vince, his wife Mary and Nic Brown. And yes, Kingdom of the Spiders is definitely one for your collection or go to You Tube and check out the whole movie right now! . I think every James Bond fan rejoiced when Goldeneye was released in 1995. It had been a long six years since License to Kill and Pierce Brosnan was finally given his chance to show the world what he could do as agent 007. Flash forward to 2002. After four movies and for as much as I liked Brosnan in the role, the franchise clearly needed a shot in the arm after Die Another Day. It had become too reliant on gadgets and Halle Berry stole too much of the spotlight. After another four year wait, we finally got the news that Daniel Craig had been cast as the new Bond…and the fan community erupted. He was blonde, he didn’t look the part, he wasn’t suave enough. They missed Brosnan in the role and wanted more after just four films. However, he was turning 50 and they were moving Bond into a new direction. Just about everyone changed their opinion once Casino Royale was released in 2006. It became the highest grossing Bond movie earning nearly $600 million…at least until Skyfall. 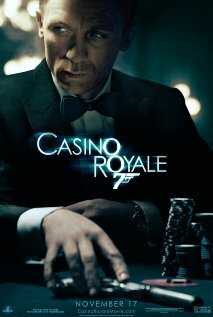 For starters, we were finally getting to see a proper version of Ian Fleming’s Casino Royale. There was the 1954 television special starring Barry Nelson, which really isn’t true Bond. Then there was the 1967 spoof, of which I am not a fan. Now, we could finally see the story as it was meant to be. However, with the story taking place early in Bond’s career, it was said that a younger and less refined actor needed to assume the lead role. I hated to see Brosnan go but I think we were all ready for something fresh and Daniel Craig definitely provided that. His Bond makes mistakes and seems to be in the doghouse with MI6 virtually all of the time. They don’t trust him yet and even inject him with a tracker. With this movie essentially rebooting the franchise, Craig could take Bond in some new directions. He is less confident and inexperienced, and that’s what makes the movie a breath of fresh air. Don’t get me wrong, I love to watch the suave and debonair Sean Connery or Roger Moore, but Daniel Craig has an edge seldom seen by Connery or Moore. A different Bond for a different generation. The story isn’t the most complex of Bond adventures. Our main villain is Le Chiffre, as played by Mads Mikkelsen (Clash of the Titans). He short-sells stocks in major companies and then orchestrates terrorist activities to cause their stock price to drop. After Bond foils his plot (which involved a stunning chase at an airport), Le Chiffre sets up a high-stakes poker tournament at the Casino Royale in Montenegro. Bond is entered into the tournament and paired up with a Treasury agent named Vesper Lynd, played by Eve Green (Dark Shadows). After a near-fatal poisoning, Bond wins the tournament only to be captured and brutally tortured by Le Chiffre for the access codes to the Swiss bank account where the money is being held. Le Chiffre is suddenly killed by the mysterious Mr. White (Jesper Christensen), who is a liason for a mysterious organization. Bond awakens in a hospital and ultimately resigns from MI6 to be with Vesper. However, Vesper is using him to get to the money to save her kidnapped boyfriend, who is being held by the organization. She sacrifices herself to save Bond, an act that, combined with the initial betrayal, leaves Bond hardened and unable to trust anyone. This seems to be the final step to Bond becoming a true 00 agent. In the final scene, Bond catches up to Mr. White in what was only the second time in the franchise history that a Bond movie ended on a less than pleasant note and the first time we were left with what was really a cliffhanger and a promise for more to come. The action in Casino Royale is ramped up to new levels never seen in a Bond movie before. There are some changes that are hard to take. The iconic gun barrel opening is gone for the most part, although is present in a somewhat modified version. Judi Dench was back for her fifth appearance as M but for the first time in franchise history, Miss Moneypenny is gone. Q is also missing but we do get CIA agent Felix Leiter, played by Jeffrey Wright. Our opening theme is “You Know My Name”, performed by Chris Connell and heard sporadically throughout the film. The classic Bond theme appears at the end of the film as Bond confronts Mr. White. And, as always, we see the immortal words “James Bond Will Return”. Casino Royale is a different take on Bond and I thoroughly enjoyed it. Highly recommended. If you’re still skeptical on Daniel Craig’s performance, give him a chance. 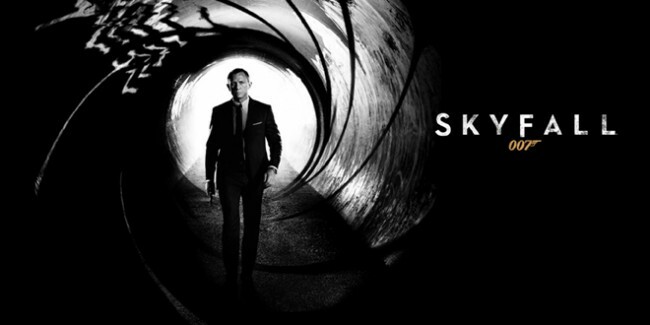 Check out the HD trailer that will surely make you a 007 fan! Did John Carradine ever star in anything we can call a classic? Oh sure, he put in supporting roles here and there in classics like The Ten Commandments. But with 340 movies and TV appearances to his credit, it sure seems like he had a knack for starring in c-grade movies. Now, I think he can be quite entertaining and he co-starred with legends like Bela Lugosi and Vincent Price. But he never quite became selective enough with his film choices. 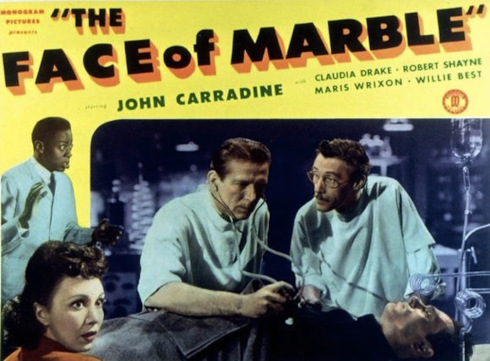 Sometimes, movies are buried for a reason and I think there are certainly some sound reasons for the burial of The Face of Marble (1946). John Carradine plays our resident mad scientist Dr. Charles Randolph. He’s looking for the secret of bringing the dead back to life. He’s helped by young Dr. David Cochran, played by Robert Shayne (The Neanderthal Man and The Indestructible Man). Claudia Drake (Detour) played the lovely Elaine Randolph, who was apparently saved by Dr. Randolph at one point and now yearns for young Dr. David. Rosa Rey plays the maid and wannabe voodoo expert Maria while Willie Best adds humor as the now-stereotypical scared butler. It doesn’t take long for this movie to meander around as ideas are introduced then dropped then resurrected again later in the movie. It never really decides what it wants to be. Dr. Randolph is obsessed then he agrees he’s doing wrong then saves his wife then is remorseful. David seems like he’s interested in Elaine but then all of a sudden he’s engaged. Maria is whipping up voodoo magic left and right. Dogs hungry for flesh…but they’re ghosts…sometimes. There just doesn’t seem to be any solid direction. As for the title of the movie, it plays a part during the resurrection process. The dead’s face turns to marble for some reason. It’s never explained at all and really not a big part of the movie. Oh, and when the dead come back to life they’re insane, sort of. They are also solid, sometimes, and then turn to ghosts when it’s time to walk through walls. And if you want them to disappear and never come back, you apparently turn on the lights. Confused yet? The story was written by Edmund Hartmann, who had talent as a screenplay writer as he did quite a bit of work, including several films starring Bob Hope and Abbott and Costello, as well as some of the Sherlock Holmes movies for Universal. However, it seems the ideas were better left to someone else. It was directed by William Beaudine, who has 366 titles to his credit but none of them academy award-winners. There are a lot of B-movies, some of them entertaining (Voodoo Man with Lugosi) and some not entertaining (Bela Lugosi Meets a Brooklyn Gorilla). Carradine’s presence makes the movie watchable to a point but you have to go in with very low expectations and with an extra 80 minutes of your day just waiting to be used up. It’s not available on DVD but is on Netflix streaming. Add it to your cue for a curiosity but keep it low on the list. There are those horror movies we all consider classics, such as Frankenstein or Dracula. Others get labeled as b-movie favorites, like The Killer Shrews or I Was a Teenage Werewolf. Then, there are films seemingly lost or forgotten, never to grace a big screen or late movie again. Sometimes, these movies are truly stinkers best left buried. Trust me, I’m still looking for that lost 70 minutes I gave to the Petrified World. Never heard of it? Count yourself lucky. However, every now and then, a fun little flick resurfaces for a new generation to discover. Such is the case with The Maze (1953). The Maze was originally released in 3D during the initial craze that swept theaters. Anything 3D would bring in the crowds. For director William Cameron Menzies, he was well-remembered for directing the burning of Atlanta sequence in Gone With The Wind (1939), the dream sequence in Alfred Hitchcock’s Spellbound (1945) and countless other films including Things To Come (1936) and Invaders From Mars (1953). 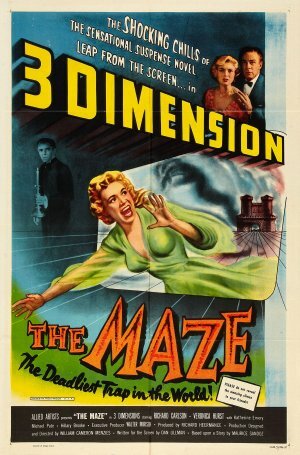 Sadly, The Maze would be his last movie to direct prior to his death of cancer in 1956. With so many other legendary films to his credit, it’s no surprise that The Maze tends to be overlooked. At 80 minutes long, the first 75 or so are atmospheric and engaging, if not a little drawn out. However, the film utterly collapses in the last five minutes. Richard Carlson (Creature from the Black Lagoon and It Came From Outer Space) heads up our cast as Gerald MacTeam, a rather unconvincing heir to a Scottish castle complete with a maze made of bushes. All Scottish castles have them apparently. He’s engaged to Kitty Murray, played by Veronica Hurst, who never had that big break and certainly isn’t a household name. After Gerald receives word from that his uncle has died, he leaves to settle the estate and never comes back. Kitty wants to go to him at the castle but her aunt just tells her to forget the whole thing. She ignores the advice and the two go to the castle only to find Gerald has gone gray and tells her the engagement is off and to go away. She stays to figure out what is really happening. What follows is in true old dark house form with mysterious servants, locked bedroom doors and shuffling in the night. Even after she invites some friends to help Gerald with whatever is bothering him, he remains rude and insufferable. You have to give it to her for remaining by his side. The movie really works up to this point and leaves you guessing as to what is really going on. However, once the mystery is solved, you discover why the movie is forgotten. I won’t spoil it for you, suffice to say it really pushed even my imagination to the limits. Add to that the strange narration from Katherine Emery, who played Aunt Edith. It’s uneven and a little unsatisfying but worth checking out. I recommend The Maze for a fun way to spend 80 minutes. Just brace yourself for the ending that leaves you wanting something that at least made a little more sense. It’s obviously not in 3D anymore and I don’t remembering any sequences that would have been good in 3D. You won’t find this on DVD and doubtful it will ever show up on TV. But it’s out there for the world to enjoy through Netflix streaming.